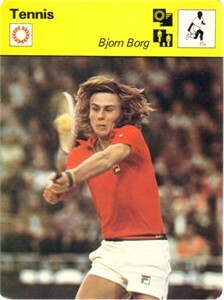 1979 Sportscaster tennis Rookie Card of the legendary Bjorn Borg. Oversized (about 4 1/2 by 6 1/4 inches). NrMt or better condition (cards were made with rounded corners). ONLY ONE AVAILABLE FOR SALE.